This Novomatic jungle is thick, lush, green and full of undiscovered treasure! The Jungle Queen rules this jungle and all of the animals in it. Dense, tropical trees have grown over ancient ruins in the heart of this jungle. You can summon the Jungle Queen and get big wins by spinning the reels! When she arrives, you can also get Free Re-Spins! Jungle Queen is a slot game from Novomatic with a payout percentage (RTP) of 95.09% - which is pretty good for Novomatic. There are plenty of other developers who make slot games with higher RTPs but the difference is, with Novomatic games you can actually win even if you don’t trigger the special feature. Unlike other slots from other developers that have higher RTPs but where you have to trigger the special feature (or Free Games) to win anything at all. The symbols in Jungle Queen give out decent wins. The slot can be played manually or automatically with autoplay. There’s a gamble game and you can win Free Re-Spins whenever the Jungle Queen arrives. She also doubles the number of paylines so double the potential number of wins! There’s a myriad of other slots from Novomatic that are based on the same (or a very similar) theme. Try them out here for fun: Book of Ra, Temple of Secrets, Quest for Gold, Golden Ark and Jungle Explorer. A Queen wouldn’t be a Queen if she didn’t rule over something and this Jungle Queen rules this game! She’s the most amazing symbol to spin on the reels as she can fill in for any of her subjects. All symbols (apart from the Scatter symbol) can be substituted by the Jungle Queen. This only happens if she lands where she can step in to form part of a winning combination of symbols. A winning combination of symbols consists of three, four or five matching symbols that follow a payline and have landed on consecutive reels, starting from the reel on the far-left. Winning combinations of symbols award payouts. The paytable displays the real-time figures for every payout in the game, as it updates itself when you alter your bet. You can alter your bet by increasing or decreasing the number of lines you want to bet on (min: 1, max: 20) and the amount you wish to bet on each line (min: 0.01, max: 2.00). Your bet per spin will be the number of active lines multiplied by your bet per line. 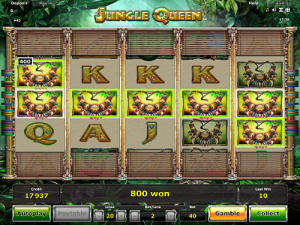 You can gamble your payouts in Jungle Queen and each time, you have a 50% chance of losing or doubling the payout. The gamble game has different stages, so if you keep getting lucky, you’ll be able to keep doubling the payout until you make it all the way to the top! From the lowest-paying symbol to the highest-paying symbol, you’ll find: the Jack, the Queen, the King, the Ace, the Queen’s sword, the Queen’s necklace, the green snake and the capuchin monkey. The Scatter symbol pays even more than the capuchin monkey! The best thing about the Scatter symbol is that it doesn’t have to worry about paylines or consecutive reels – as long as three or more land on the reels, they’ll pay from whichever position they happen to land on. The Jungle Queen Wild symbol can turn up on the reels whenever but not all of her may be visible! When this is the case, whichever symbols she covers will act like Wild symbols and the game will continue as normal. If she lands on the reels in full-view and you can see her in all her glory (covering an entire reel, 3 positions), she will trigger something very special indeed. Normally, the reels are only 3 positions high but when she lands on the reels, she expands and makes the reels even bigger – expanding them to 5 positions/rows to a reel. Every position she covers (5 in total) will act as Wilds and she will stay in place for the 5 re-spins she triggers. If another Jungle Queen symbol lands covering another reel, it will also stay in place and the game will give you one addition re-spin.